ANOTHER DOSE of totally baseless information and factoids or or about political figures, government officials, and other prominent individuals and organizations in the Philippines. 131: Since the launch of her TV ad, Mary Grace Poe has uttered the word “Poe” 2,728 times. 133: Cynthia Villar and Florence Nightingale were frenemies in their past life. 134: According to a study, men speak an average of 7,000 words per day. Richard Gordon speaks 14,000. 137: The Office of the Vice President has a pet dog named Jejemon – Jejemon Binay. 138: If she wins in May, Jamby Madrigal will donate 50 units of iPad to Comelec. 139: Ninety-seven percent of party-list group nominees are millionaires. The rest are getting there. 140: Reelectionist Manila Mayor Alfredo Lim drafted his concession speech as early as January. 141: The number of complaints against Globe and Smart is more than twice the number of complaints received by all government offices and agencies combined. 142: Sen. Kiko Pangilinan’s wife Sharon is still very active on Twitter. She tweets using a parody account. 144: Congressional aspirant Annabelle Rama has not fought with anyone publicly for almost four months now – an all-time, personal record. 145: Risa Hontiveros is a huge LA Lakers fan. 146: There are more Filipinos in Sabah than in Sulu. 147: Chiz Escudero and Heart Evangelista are just good friends. 148: A music lover since birth, former Senate President Ernesto Maceda has never missed a single episode of ‘Glee.’ He’s starting to get hooked on ‘Pretty Little Liars’ too. 149: Isko Moreno once bagged the 250,000-peso grand prize in a Bingo game. 150: Jack Enrile believes he’d lose the elections if his last name wasn’t Enrile. 151: When the RH Law was passed, the Diocese of Bacolod banned gays and lesbians from attending Sunday masses. 153: Congressional candidate Aga Muhlach thought Bicol was a province. 154: Gloria Macapagal-Arroyo left the country for the United States via Cebu last Sunday. 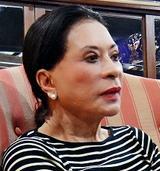 155: Tingting Cojuangco’s face is younger than her body. In case you missed, Rumors, Facts and Humor 1-4. On international womens day de lima and padaca celebrate by bullying a ‘sister’ into submission. 166. mar roxas seriously consideering dumping korina for aye-aye so his chances vs binay in round 2 (2016) will improve.